Clothing no gentlemen should be without, the sports jacket and blazer are perfect ways to complete a casual outfit. Our sports jackets and blazers vary based off of your choices in design and your needs as an individual. A double-breasted, peak lapel, navy blue blazer with silver buttons will have you looking perfect for that evening at the club, or design a single breasted, black and white houndstooth tweed sports jacket for your family reunion in Maine. 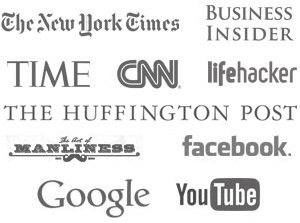 The possibilities are endless, the final product is up to you. To learn more about men’s custom tailored sports jackets and blazers, visit our style guide. Below are pictures of one of our finished men’s bespoke sports jackets. This men’s sports jacket is a two button, single breasted, notched lapel, with a regular fit cut. 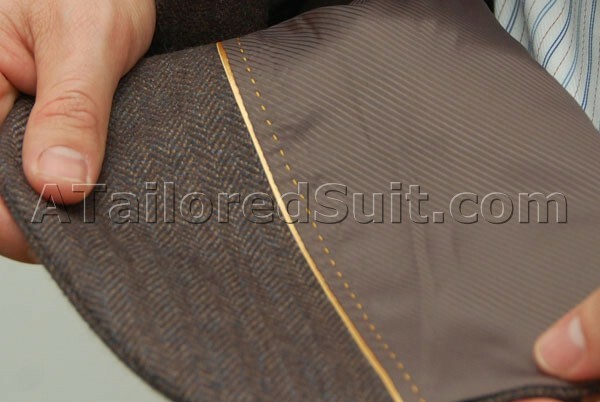 The fabric is a brown herringbone tweed with a touch of blue. 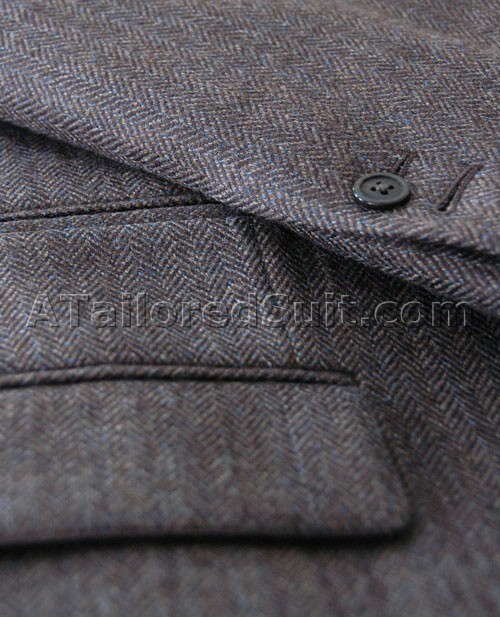 A heavy weight fabric, this men’s jacket is excellent for fall, winter, and early spring wear. Here we see a bespoke gray men’s sports jacket with subtle blue stripes. 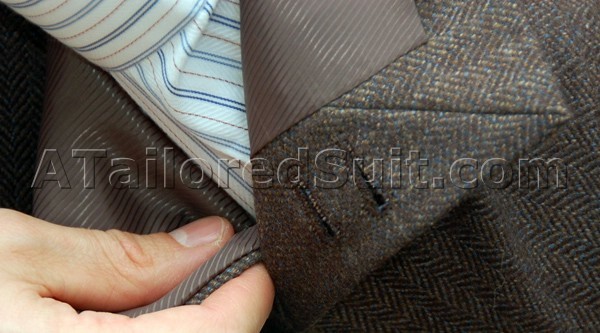 Notice the hand stitching along the notch lapels and the fully functional boutonniere hole. Instead of wearing a tie, this client has opted to infuse some color around his neck with a contrasting inner collar. 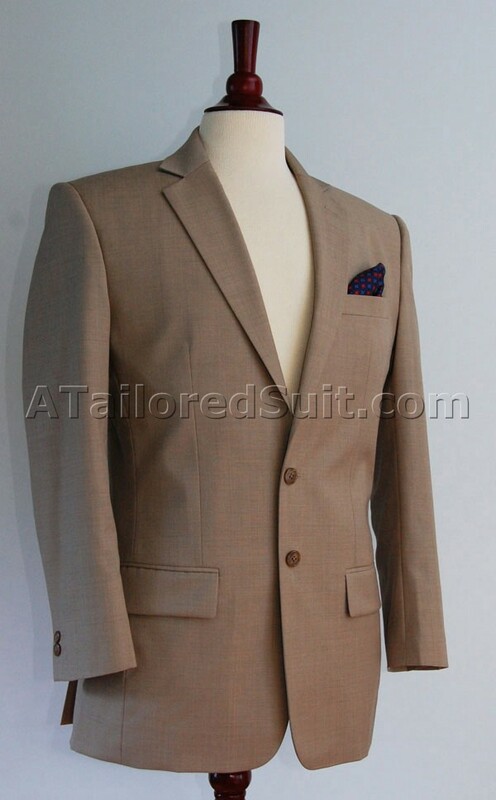 Here we see at tan sharkskin custom two button sports jacket with two buttons on the sleeve to highlight the casual nature of the jacket. But as if to bring us back to its regal origins, the client opted for roped shoulders that cut a striking silhouette. This gentlemen chose to have only two working buttons, as that he wanted to keep it consistent with his front button choice. 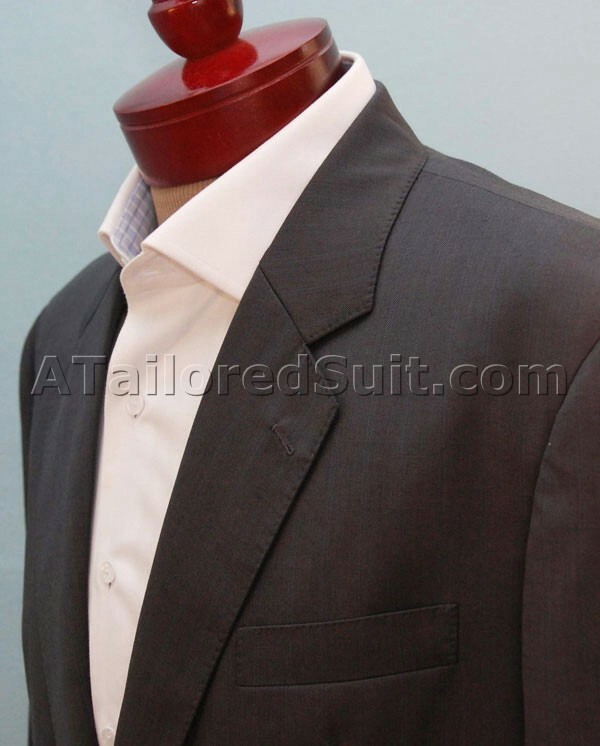 All of our button are fully functional (a hallmark of handmade suits). 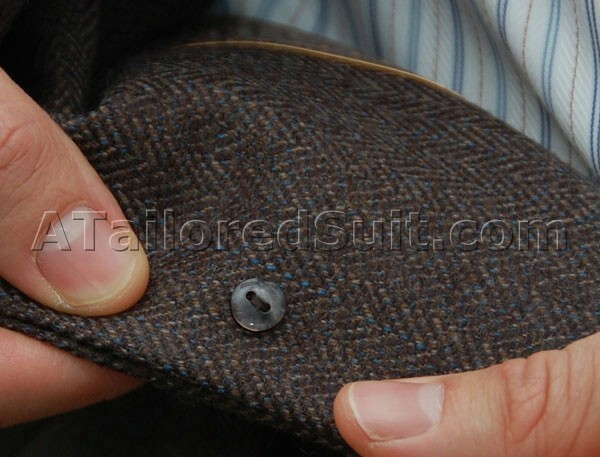 Another example of working sleeve buttons on a custom bespoke jacket. Most people will never see the inner lining of your sports jacket or blazer; that’s a shame, because the interior of our jackets are just as beautiful as their exteriors. Here is an example of a very bright lining that the client wanted to show off when he removes his jacket – a young consultant, he wanted to signal that this wasn’t an off the rack buy. For most men though, we suggest letting us match the lining with the jacket. Called piping, this gold lining helps bridge the gap between the bespoke jacket’s lining and it’s fabric. A small but important detail. Your jackets front buttons can be called upon to withstand a bit of stress. Every sports jacket we make has these tiny back buttons sewn behind their larger counterparts to help distribute the pressure. What does this mean for you? A longer lasting Sports Jacket and Blazer. 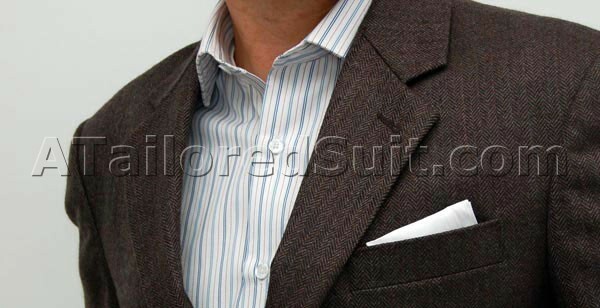 You rarely see ticket pockets on ready-made men’s suits. 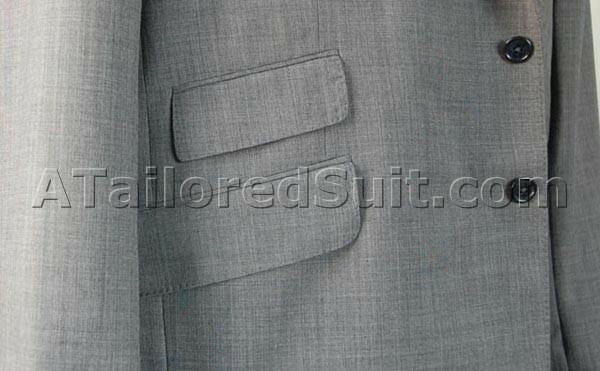 This detail is often found right above the right side pocket on a jacket, and sends the signal that this garment is not your run of the mill clothing. Ticket pockets looks especially regal on tall men. 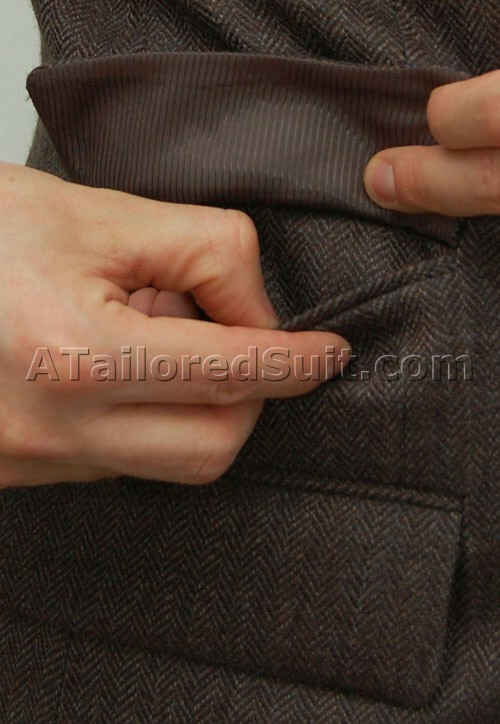 Below you can see the English variant, the angled hacking pocket. Angled pockets trace their origin back to the English riding jackets. A functioning ticket pocket – what do you use it for? Well, to hold tickets of course! All of our pockets are convertible. 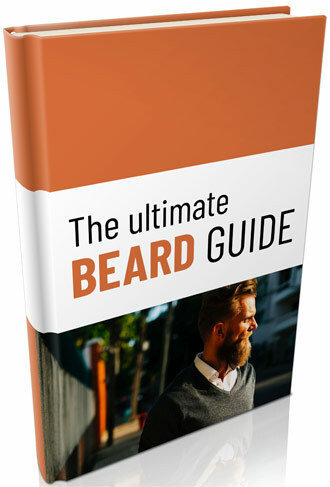 That is, they can be worn as either flapped or tucked in. The tucked in look is for the occasions you are looking to raise the level of formality of the coat or just want to try something new. If you are going for a casual look, consider flap pockets (not shown).